You are here: Home / Dogs / Does your dog enjoy a trip to the vets? Does your dog enjoy a trip to the vets? One of the day to day issues we have to think about is that a lot of dogs just don’t like coming to the vets! A survey of owners found that 38% said their dog hated trips to the vets and 26% said they got stressed thinking about taking their canine friend! Obviously, if your dog is ill then we need to see it, it is easier for us at the surgery where we have all the kit we need, and trained staff, rather than doing a house visit. So we all have to make visits as stress free as possible for dogs and owners alike. 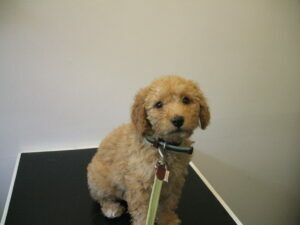 Dogs learn easily so if they have had a previous bad veterinary experience it re-enforces unease. You can leave your anxious canine in the car until we’re ready to see you, just come in and tell reception you’ve arrived. We can see your dog outside the surgery, at the side of the building for example. You can request an appointment at the beginning or end of surgery when there should be few other animals around. 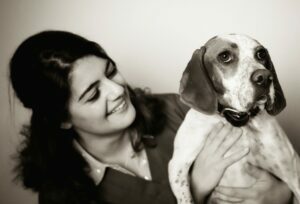 Bringing more than one person with each dog helps, dogs draw reassurance from ‘their’ pack. It also allows one person to care for the dog whilst another deals with our staff. Dogs want to co-operate but they have a basic drive to succeed and survive which can override co-operation. They also like to have a choice, not always the case at the vets! ‘Freeze’ to hope the threat passes. ‘Communicate’ to ‘make friends’ with the threat. ‘Avoid’ the threat (this isn’t possible in a vets!). ‘Actively Avoid’ the threat. This involves running away (difficult in a vets) or in extreme cases, aggression. If aggression works (i.e. it makes the vet go away) then a dog remembers this as a success! Dogs that are excited when they come to the vets (straight from daycare for example), or in pain (a reason for coming to the vets) tend to react worse. This is one reason why sometimes we don’t examine a dog on the first visit, just give pain relief then see the next day. Your dog might be very well behaved away from the vets but when he or she is here they may struggle to cope as their training is no longer appropriate. Dogs in a vets may release ‘alarm’ pheromones which are designed to survive all weathers so can be difficult to clean away. There are new smells (disinfectants etc), new sounds (often ones we can’t hear)and new social situations. With this lot it is no wonder your pet can be distressed! Some dogs won’t take treats from a vet, but if told to sit by the owner they then will as they have been given reassurance and guidance. 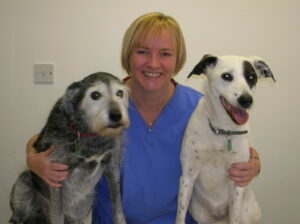 Every time a vet or nurse handles your dog we shape their behaviour. We have to recognise signs of distress in our patients and work to allay them as much as possible. We offer a complimentary health check for any new pet and free puppy parties which let your pet experience the surgery in a situation where nothing ‘bad’ happens. We try and make all visits as enjoyable as possible, please tell us if you think there are ways we can improve. https://www.withygrovevets.co.uk/wp-content/uploads/2017/11/DSCF0438.jpg 2304 3072 Michael Clarke https://www.withygrovevets.co.uk/wp-content/uploads/2019/04/Withy-Grove-logo2.png Michael Clarke2017-11-11 12:27:302018-05-15 15:57:23Does your dog enjoy a trip to the vets?